A conversation with Susan Gillis on "the hospital gig"
Susan Gillis writes a blog called Concrete & River in which she interviews poets about their work. In early January, she and I had an email conversation about my work as Poet in Residence at Sinai Health. 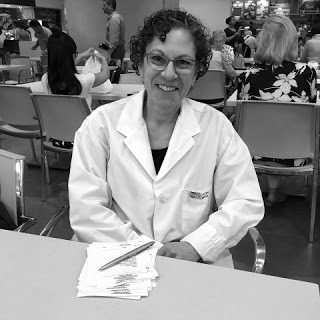 "For several years now the poet Ronna Bloom has worked as Poet in Residence at Mount Sinai Hospital, dispensing poetry to patients and staff in need of what poems offer. I chatted with Ronna about her work in this program: how it came to be and how it unfolds in her own and others' lives." SUSAN GILLIS: Often I come across references to you being busy with "the hospital gig." Could you explain what "the hospital gig" is? How did it begin -- was it an existing position, or did you (or someone else) propose it and convince somebody that it would fly? Read more.